As has been the case in the 2018 Monster Energy NASCAR Cup Series Playoffs, Sunday’s second round opener at Dover’s Monster Mile proved it ain’t over till it’s over. And again, it was the veterans opening the door for younger drivers to come on in to the Playoff party. 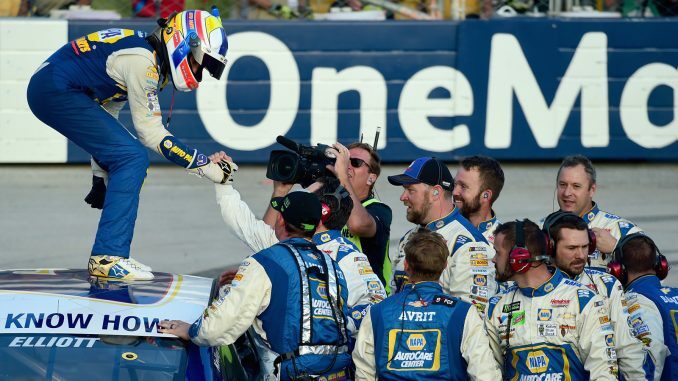 Such was the case this weekend as Chase Elliott earned his second career Monster Energy Series victory and an automatic berth into the Round of Eight. Dover (Del.) International Raceway has historically been one of Elliott’s best tracks but his opportunity to win was amplified by a couple late race cautions – one involving his closest competition – and also by a great call not to pit during the ensuing yellow flags. Bottom line, the 22-year old held off the field for the final 11 laps – giving him two runner-up finishes and a victory in six Dover starts. As importantly, it gives the driver of the No. 9 Hendrick Motorsports Chevrolet all kinds of momentum with six races left to decide a championship – and a place already reserved for him in the next round. It was the biggest win of Elliott’s young career and a real crowd pleaser. “Oh, huge,” Elliott said of the victory. “I mean, I think it’s nice to be able to know you’re going to move on, but you can’t get complacent in the fact that you are moving on, and you can’t let those points just sit out there and not try to go get them because those bonus points you get for winning or winning a stage or winning a race or whatever, that’s huge, and you need as many as you can get. The series’ youth movement got a start a week earlier with Elliott’s good friend, 24-year old Ryan Blaney hoisting his own winner’s trophy. He turned a strong run at Charlotte’s new ROVAL race into an automatic place in this round – and as with Elliott – was able to take advantage of a late race melee between front-running veterans. Two former champions – Jimmie Johnson and Martin Truex Jr. – crashed out together while vying for the lead only a few turns from the checkered flag. And Blaney blasted through. In a season dominated by the “Big 3” – all former Cup champions Kyle Busch, Kevin Harvick and Truex – the Playoffs have presented a legitimate youth counter-movement. 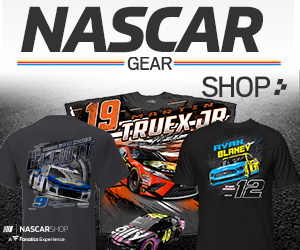 The Big 3 combined to win 17 of the 26 regular season races, but Busch is the only to win in the four Playoff races to date, scoring his seventh victory of 2018 at Richmond Raceway two weeks ago. Former series champion Brad Keselowski – Blaney’s Team Penske teammate – won the Playoff opener at Las Vegas. And since then, a pair of 20-year olds – Blaney and Elliott – have shown the veterans that they are absolutely primed to challenge for this championship too. To be fair Harvick, a seven-time winner this season, dominated the day at Dover – leading a race high 286 laps – before a pit road issue put him a lap down late in the race. He turned in an inspired comeback and rallied to a sixth-place finish. Truex was also running up front when he was involved in a five-car accident with two laps remaining and finished 15th. Harvick has led 340 laps in the Playoffs and was runner-up to Busch at Richmond. His showing Sunday was good enough to give him the championship lead by five points over Busch. Truex has led 264 laps in the four Playoff races, with a best showing of third both at Vegas and Richmond. He is third in the standings, 32-points behind Harvick. Blaney’s 11th-place finish at Dover was enough to keep him among the top-eight entering Sunday’s always-exciting 1000Bulbs.com 500 at Talladega (Ala.) Superspeedway. Elliott’s win is a free pass to the next round and moves him to fifth place in the points standings – important with such an unpredictable venue as Talladega next up. Keselowski is the defending winner of the Talladega Playoff race and Penske teammate Joey Logano won at the track earlier this year. Six of the last eight races – including the last four Talladega Playoff races – have been won by the Team Penske teammates. Keselowski, who scored his first ever Monster Energy Series win at the track in 2009, won the 2014 and 2017 Playoff races there and the spring 2016 race. Logano won the 2015 and 2016 Playoff races as well as this year’s spring 500-miler. For his part, Elliott won the pole position at Talladega in his very first start at the track (2016) and finished sixth in that race. He was third behind Logano and Kurt Busch this year and has finished top-16 in his two previous Playoff races there. A win at the superspeedway, where Elliott is already a hugely popular driver among the Alabama fans would be a huge accomplishment personally, and a great shot of adrenalin for the whole crowd. “Anything is possible, man,” Elliott said of turning his win at Dover into a legitimate title shot going forward. “There’s no reason at all we can’t make a run at this deal. I thought we made a great run at it last year.